Summary - One night at an inn changes a young soldier's life forever. “Drinks for all my men, please!” Captain Thorongil told the comely tavern wench at the “Seven Stars”. She fluttered her eyelashes flirtatiously, but the Captain simply smiled and looked away. His expression was strained and he flushed. “Three cheers for the Captain!” cried Ragnor, a young lieutenant. The men cheered and raised their tankards. “Why do you care that the enemy has few casualties as well as us?” asked one man, emboldened by the ale. “They are Men too, Turgon, albeit misguided ones,” said Thorongil. He shifted restlessly in his chair. Turgon frowned but said no more. Ragnor thought his Captain looked weary and began singing a popular ballad about a soldier and his sweetheart to raise his spirits. The rest of Thorongil's company joined in as did the villagers who usually drank at “The Seven Stars”. Suddenly Thorongil gave a muffled cry and collapsed across the table. Ragnor, who was sitting beside him, leapt to his feet and called for help. “He's not even drunk one mug of ale!” Ragnor protested. He placed his hand on Thorongil's forehead. “He has a fever!” he exclaimed. “Is there a healer in the village?” asked Ragnor. The men, so jolly a few moments before, were now subdued and anxious. They expressed their concern for Thorongil. Between them, Ragnor and the Innkeeper carried the unconscious Thorongil upstairs to a small guest chamber and laid him on the bed. His long legs dangled limply over the end. As soon as the man had gone, Ragnor secured the latch on the door. Captain Thorongil was a reticent man and Ragnor felt as few as possible should witness any secrets he might uncover. At nights round the campfire, even when only with his closest comrades, Thorongil would reveal little of his origins. Ragnor had served with him for five years now, and while he and his comrades had freely shared stories about their homes and families, all Thorongil had ever told them was that his father had died in his infancy, he had come from the North to seek his fortune, had left a much missed mother there and was in love with a beautiful maiden. Despite his reticence concerning his own affairs, Thorongil was interested in the lives of his men and often enquired about Ragnor's sisters, sweetheart, and the father he had disappointed by becoming a soldier rather than a healer. Ragnor had never known anyone quite like the Captain, so valiant in battle, yet also so wise and compassionate, a healer as well as a soldier who bound up his men's wounds and listened to their troubles. Despite his worries for Thorongil, Ragnor was glad that he was insensible as he undressed him; certain were that not so, he would have the mother of all battles on his hands. Thorongil's cloak was stained with blood. Ragnor unfastened the star shaped brooch that secured it and put it carefully aside. The tunic beneath was torn and equally stained. He eased it over Thorongil's head and did likewise with the blood soaked shirt beneath. Ragnor was surprised to discover that beneath his clothing, Thorongil wore on a chain a heavy gold ring engraved with two entwined serpents, their eyes made of fine emeralds. It looked to be of great value. He lifted the chain over the Captain's head and placed it in his own tunic pocket for safety. It was easy now to see what ailed the Captain. Thorongil's shoulder was bandaged heavily. Ragnor undid the wrappings and revealed an ugly festering wound that looked angry and inflamed. It appeared that Thorongil had tried to tend it himself, but been unsuccessful. Ragnor pulled the covers over the Captain and called to the serving maid to bring hot water. He was glad now that he had learned a few healing arts from his father before he decided a soldier's life held more appeal than spending his time mixing potions and treating festering wounds. As soon as the girl brought the water, Ragnor cleaned the wound as best he could. It was bright red and the flesh was hot to his tentative probing; yet Thorongil was not sweating. A few minutes later Master Bor arrived, a bent old man who could hardly get up the stairs and had to be assisted by the innkeeper and his granddaughter. His eyes were keen, though, and much to Ragnor's relief, he seemed to know what he was talking about. With that meagre comfort, Ragnor had to be contented. Bor shouted for his granddaughter and hobbled off down the stairs again, holding to her arm. Ragnor sighed. It seemed he would have to put the arts his father had tried to teach him to use. The Captain's pack lay by the side of the bed. Ragnor rummaged through it until he found what he was looking for; the knives Thorongil kept there. The Captain was known for his healing as well as his military prowess and many of his men owed their lives to his skill at stitching wounds and extracting arrows. Ragnor had often cherished fantasies of becoming a hero by saving the Captain's life, but by glorious feats of valour on the battlefield, not like this! Feeling slightly queasy, he chose the sharpest of the knifes and placed it in the fire to heat. He then called for the maid to bring more boiling water and some ground cabbage leaves. When the blade was ready, Ragnor wondered if he should ask the innkeeper to hold Thorongil down, but decided against it as he had hardly stirred since his collapse. He rummaged again in the Captain's pack and found a good supply of clean bandages. He could delay no longer. Thorongil groaned when Ragnor probed the wound with the blade, but did not awaken. Neither did much of the infection drain from the wound. Ragnor made a poultice of the ground cabbage leaves and sat pressing it against the inflamed flesh for about half an hour. Then he bandaged Thorongil's shoulder and sat on a chair by the bedside to wait. Despite his best intentions, Ragnor nodded off. They had had little sleep the night before and had marched many miles before reaching the inn. In a small stuffy room with only an unconscious man for company, weariness eventually overcame him. He was awakened by agitated cries from the man on the bed. A loud groan was his only reply. Darkness had fallen. Ragnor fumbled to light a candle. “She is coming,” Ragnor lied hastily. Thorongil’s tone wrenched Ragnor's heart. Never had he expected to see his brave Captain’s spirit reduced to that of a frightened child. Awkwardly, he reached for Thorongil's hand, knowing the Captain would do the same for him. The hand he grasped was hot and clammy. Thorongil seemed oblivious to his presence. Ragnor decided that since the Captain was now conscious, he would give him some willow- bark tea. He placed a pan on the fire to warm some water. While he waited, he checked the bandages and was relieved that the wound was starting to ooze a little. He was just debating whether to apply another poultice when a knock came at the door. Without waiting for permission, the serving maid entered, carrying a laden tray. “How is he?” she asked. She placed the tray on a table. Ragnor scooped up the blood stained garments he had earlier divested the Captain of and handed them to the girl. She grimaced as she tucked them under her arm. Ragnor sighed when she closed the door behind her. It was obvious she had notions of mopping Thorongil's fevered brow, but he could not let some tavern wench hear the Captain crying for his mother. He contemplated the contents of the tray, roast mutton with potatoes, and what must be the rest of the cabbage, a large dish of stewed apples and a mug of ale. There was also a pitcher of fresh water. He was not very hungry, but the simple food was tasty and he ate, all too well aware that he must keep up his strength. Thorongil’s feverish tossing continued as Ragnor ate, and still he called out for his mother.As soon as the young man had finished his meal, he mixed the willow-bark tea and tried to tempt Thorongil to take some. The Captain coughed and spluttered at the bitter taste. Ragnor eventually got it down with alternate spoonfuls of stewed apple. He applied a fresh poultice of cabbage leaves and was relieved that Thorongil appeared to settle a little. He coaxed him to swallow some water. “Mother! Sorry…Elrond…love her, had to…” The disjointed rambling went on, and though Ragnor understood little of it, still he tried to soothe Thorongil. Thorongil muttered for a little longer then fell into an uneasy sleep. Ragnor decided he might as well try to rest too and settled himself in the chair as best he could. The candle had burned low when he awakened again. To his dismay, Thorongil had thrown off his covers. Ragnor hastily covered his Captain again and then felt his brow. He was sweating profusely. “Arwen? Love you…ache…on fire! Win the crown…earn the right…wield sceptre. Arwen…worthy…” Thorongil cried. “I'll bring some,” the man replied. “That is kind of you,” said Ragnor. Ragnor dipped a cloth in the bowl of warm water and started to bathe Thorongil's face and neck. “Arwen…so fair… Only you…remain alone…line fail…prophecy…we…of Lúthien’s blood!” mumbled Thorongil. Much of what Thorongil was muttering made no sense to Ragnor, but he almost dropped the cloth at the mention of Lúthien’s blood.Why, the line of ancient kings stemmed from Lúthien! He found himself studying Thorongil intensely while he bathed the sweat from his body. He was exceptionally tall and strong, despite being slender as a willow. His hair was dark and his eyes grey. All traits he knew depicted the ancestry most Men in Gondor had some small part of, but centuries of intermarriage meant only families such as the Steward's had the blood of Númenor running true in their veins. Lord Denethor was famed for having it in large measure, for not only did he have the look, but also the powers of the mind. Ragnor suddenly recalled how Captain Thorongil seemed able to sense if there was danger with more than the experienced soldier's instinct he put it down to. He could read men's hearts too. He always seemed to know what his men's greatest hopes and fears were and acted accordingly, therefore bringing out the best in those who served under him. Then there was the ring. He had never seen one like it before. Maybe it was some royal heirloom? Thorongil's grey eyes flickered open. “Could take it now,” he cried. “Denethor! Hates me! You are trying to kill me!” He grabbed Ragnor's arm and stared at him accusingly. Thorongil glared at him. “Mine! Rightfully…be king…Arwen my queen…Elrond? Halbarad cares – my people! ” He shifted onto his side, still muttering. “White tree…blossom…no hiding…son…Arathorn.” Then Thorongil wept and began again to call for his mother. Ragnor found he was trembling. 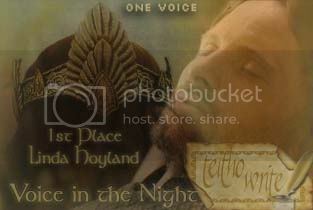 He was certain now that Thorongil was Gondor's lost king whose coming had been awaited for well nigh a thousand years. What must he do? Thorongil groaned again reminding Ragnor just how ill he was. The young man shuddered. The fear that Captain Thorongil might die in his care was bad enough, but the king? He pulled himself together. A dead king was of no use to anyone any more than a dead captain was! He tried to recall more of what his father had tried to teach him. The Captain was sweating profusely. He would need water to replace what was lost. Ragnor filled a glass of water from the pitcher. With he free hand he supported Thorongil's head. “Drink this, lord,” he said. Thorongil gulped it down thirstily. “Mother?” he asked. “She is coming,” Ragnor soothed. “Easy, my lord,” said Ragnor. “Let me make you more comfortable.” He took up the cloth again and continued sponging the sweat from Thorongil's body. He noticed then that the wound was oozing profusely. Surely that was a good sign? He dressed it again with clean bandages. He continued gently bathing his Captain and coaxed him to take more water and willow-bark bark tea. Not until Thorongil ceased to rave and fell into an uneasy sleep did he dare call for the innkeeper to help him to change the sheets. To Ragnor's great relief, apart from a few groans, Thorongil was quiet while the innkeeper was in the room. The feel of the dry, clean linen against his skin seemed to soothe the feverish man and he fell into a deeper sleep. On the chair beside the bed, Ragnor dozed fitfully. When he next awoke, sunlight was streaming through the small window. The Captain drank then reached beneath the covers. His eyes widened in alarm as his fingers scrabbled at his chest. “It is gone!” he cried. Ragnor reached into his pocket and drew out the ring on its chain. “Your ring, lord,” he said. “I took it for safe keeping,” he said. Ragnor smiled. It seemed that the Captain was well on the way to recovery. He felt a surge of elation sweep through him, at the knowledge he had helped Thorongil overcome as fierce an enemy as any he had wielded a sword against. For the first time since he had left his home village, he regretted forsaking the healer's calling. Now he realised, saving lives was more satisfying than taking them. “Is he indeed now?” The old man looked up from the potion for winter coughs he was brewing. The boy ran off. Ragnor absently stirred the mixture and stared into the fire. 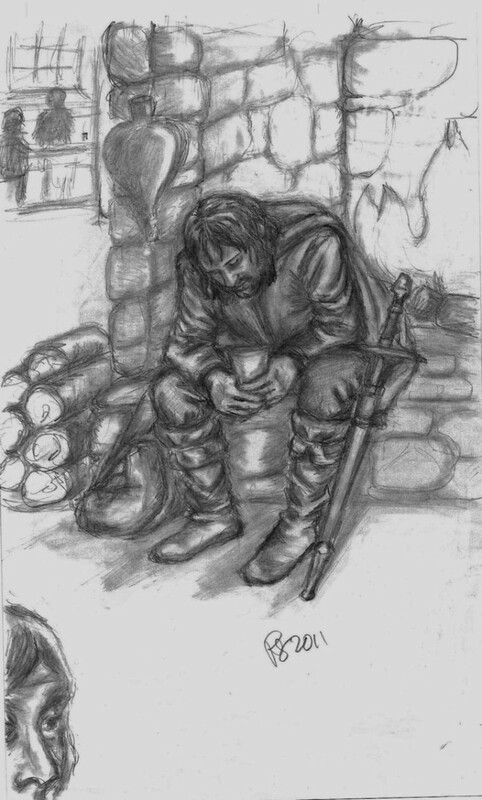 He had never spoken to anyone of that long ago night at the inn, but it had changed his life. Not long afterwards, Thorongil had abruptly left Gondor. Ragnor was one of the very few who suspected why, but he could say nothing when his comrades endlessly speculated the reason for the Captain's departure. He spent more and more time alone. The new Captain who replaced Thorongil was a decent enough man, but he lacked his predecessor's power to inspire his men. When Ragnor had been wounded, he decided not to return to a life of fighting but instead went back home and told his father he had changed his mind about becoming a healer. He found now it gave him far greater satisfaction than soldiering. He had married his sweetheart and they had had seven children and as many grandchildren and great-grandchildren. Ragnor was old now, but still keen of mind and eye. He had led a contented life, but he had never forgotten Thorongil. He had been special and Ragnor had never admired anyone else quite as he had admired his Captain. Ragnor had never seen the King, but from what Men said, he was certain that Elessar and Thorongil must be one and the same. He had heard that the White Tree did indeed bloom again, so Thorongil's fever dreams had come true. He could hear cheering outside now and debated whether or not to go outside and see the King ride past. He decided against it. He would rather remember his Captain as he was, a warm and approachable man in his prime, not some ageing and distant ruler surrounded by grand lords and ladies. Thorongil would have forgotten his young lieutenant as soon as he left Gondor. His grandson came running back inside. Ragnor took up his cane and hobbled outside. There, across the street was his Captain. Apart from a few flecks of grey in the dark hair, Thorongil had not changed at all. Beside him was the fairest lady that Ragnor had ever beheld. 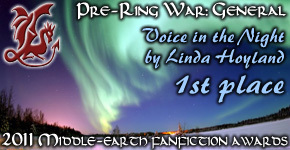 A/n This story was written for the Teitho “One Voice” contest where it was placed first.